I read this quote and thought of all the controversy and rhetoric that so many of us were caught-up in just a month or so ago. I don’t know about you but I’ve taking a step back lately needing to catch my breath and move onto healthier hopeful positive things that bring some goodness back into my life. It’s created some wedges between me and some of the people I care about. I find it’s unfortunate because it’s behind the wall of the internet that so many things have been said, misunderstood, taking out of context and assumed without the advantage and respect of a face to face conversation. Body language and facial expression play a big part in expression our passions. But more than that don’t we owe at least the benefit of the doubt to those we loved and cherished for so many other reasons that go beyond politics? I looked at the front page of the Lancaster newspaper today. Jeff Hawkes a reporter for the LNP had a perfect article called the “Bridge Tables” to go with the thought provoking quote above. It’s about a way of bringing people of different political views together in a way that they can discuss their differences in a respectful way with nothing between them except the table they sit at. The event is called the Left/Right Café and the premise behind it is to heal America’s political divide. The organizers Eric Sauder and Jamie Beth Schindler’s idea is for liberals and conservatives to come together for a respectful conversation getting past stereotypes and broadening understanding in a safe comfortable environment. Breaking bread and sharing food often has a way of bringing people together in a non- threating way. The hope is to find some understanding and a place of common ground, and from the article it appears that’s what these willing conversations did. It opened each other’s eyes that sometimes what is right to us is not so different from what the other persons believes, but even if it’s not giving one a chance to explain themselves can allow us to better agree to disagree. And who knows maybe we’d learn a fact or two that holds some truth within it giving us a chance to broaden our perspective on beliefs. I’m sitting out on the deck letting the autumn sun warm my cold bones. I notice threads of spider webs sparkling in the sunlight connecting one thing to the other. It reminds me of something I once read about the golden thread of Divinity that runs through each of us connecting one to the other. 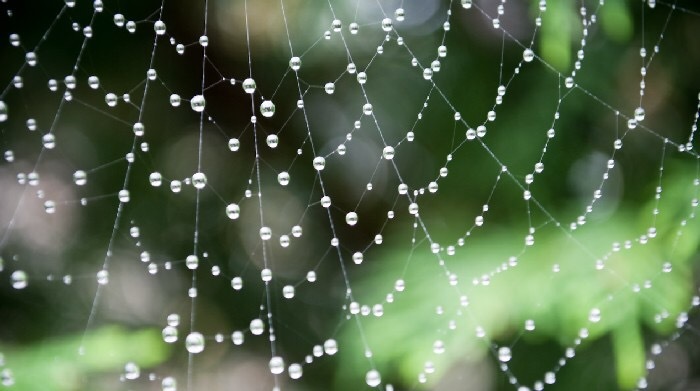 Like the spider who creates a beautiful lacy web, we can spin and weave a beautiful tapestry of our own life with the golden thread that exist within each of us. Like the spider what we create comes from within. The finished product reveals the effort we put into our weaving on the outside.